So social psychologists have conducted a number of interesting experiments on the influence of groups on individuals. 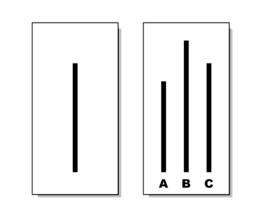 In one of my favourites, they had a group of people at a table and asked them a very simple question: which line on the right matches the line on the left? A number of groups were assembled, and asked the same set of 18 questions, similar to the above. In each group, one person was a research subject, unaware of the experiment, and all of the others were plants or research participants. The research participants were instructed to give the same wrong answer most of the time, so that the research subject would have to choose between giving the right answer against the group, or going with the group and giving the same wrong answer everyone else did. In the control condition, there were no groups: a single research subject was asked the same set of questions. These subjects got less than 1% of the questions wrong. In the groups, the research subjects were far more likely to give the wrong answer. 75% of them changed their answer to the wrong answer at least once. Morevoer, some of them actually come to believe the incorrect answer was correct. It wasn’t just that they gave the wrong answer to go along with the group, but that their minds actually changed to accept the incorrect answer. People don’t just go along with something they know is wrong, when a large group surrounding them claims it is true. They may come to actually believe it. You’re not an exception–something we’ll come back to in Part 5–and neither am I. By objective measures (and yes, there are objective measures–we’ll get to those in part 5 too) I’m less susceptible to peer pressure than most people. But it still happens. When it seems like everyone around us is singing from the same song sheet, it can be very hard to sing your own song. It’s easier to either stay quiet or sing along with the rest. But it’s precisely because peer pressure is so influential (and well beyond middle school) that it’s so important to try to speak the truth, or your own truth, especially when the majority says otherwise. In order for the conversation to change, someone has to say it first. Unlike the first four examples (potentially), standing up in the SBC isn’t going to kill you. So you may as well practice it. And bloggers, you may want to drop the claim that you aren’t being influenced by your sponsorship arrangements or that it’s a personal attack for anyone to question you or your sponsors. We’ve got to start embracing the idea that it’s ok to have public conflict and disagreement, because this is how things change–when people know that it’s safe to disagree with the group without exclusion or expulsion, then they will. That was oddly hyperbolic for a series on sponsored blogging, I’ll admit, but I’m going to let it stand.